What joy! Out of Moscow and into warm, rainy Galveston, TX. (Yes, warm. 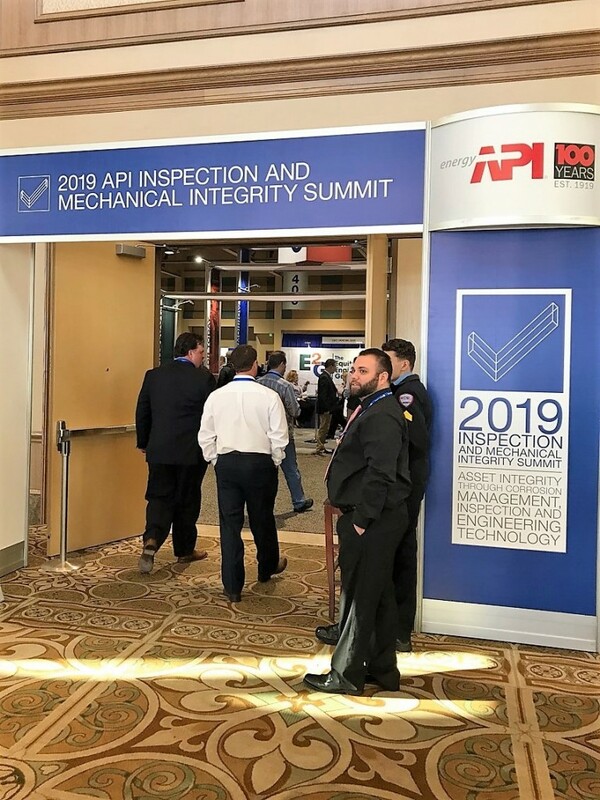 Fifties is warm when home is 30 below zero F.) I’m here for the 2019 API INSPECTION AND MECHANICAL INTEGRITY SUMMIT. Three great co-hosted events are happening today at Amsterdam’s RAI! Visit Twitter and Facebook for pictures and updates. Here are links to the event’s Twitter and Facebook page. Last week we talked about the inherent challenges when flying industrial UAVs in enclosed spaces. Today, I’d like to share how my company is addressing those challenges. Regarding the first two challenges, i.e., the lack of GPS and the absence of radio signals: NTR’s drone is truly autonomous and unmanned. In fact, the inspector only goes inside a tank to launch the UAV or change a battery. We accomplish this by using a combination of sonar and lidar to navigate walls and other obstacles. Precise positioning is realized using only on-board sensors — rangefinders, optical flow, IMU, and ultrasonic — so no connection to the real world is needed. And because one size doesn’t fit all we gave our UAV software the ability to work with any UAV frame, including drones that are ATEX-compliant. Challenge 3 was the lack of light for imaging. We equipped our UAV with powerful, impulse LED lighting allowing it to shoot quality images suitable for photogrammetry and structural inspections/image recognition. Next was the magnetometer problem — as in it doesn’t work. A bit of background: drones typically use magnetometers to navigate, move or turn against the 4 points of a compass. North is usually stated as straight ahead, west is left, east is right, and south is backwards. However, the metal borders of a tank, for example, means the drone sees all directions as north, so it spins, and a spinning drone is not particularly efficient. To fix that, our engineers removed the magnetometer and provided the drone with “eyes” in the form of 2 lidars on its head. This allows the drone to mathematically estimate its position against the wall and understand where forward and backward are; a third lidar measures height. Currently, our drone only “remembers” its height, because the exact position isn’t needed in something like a tank. We are working on a solution that will allow the drone to remember its exact coordinates, in order to return to that exact place after battery replacement or the end of a shift. The fifth challenge was providing the maneuverability required in tight spaces. 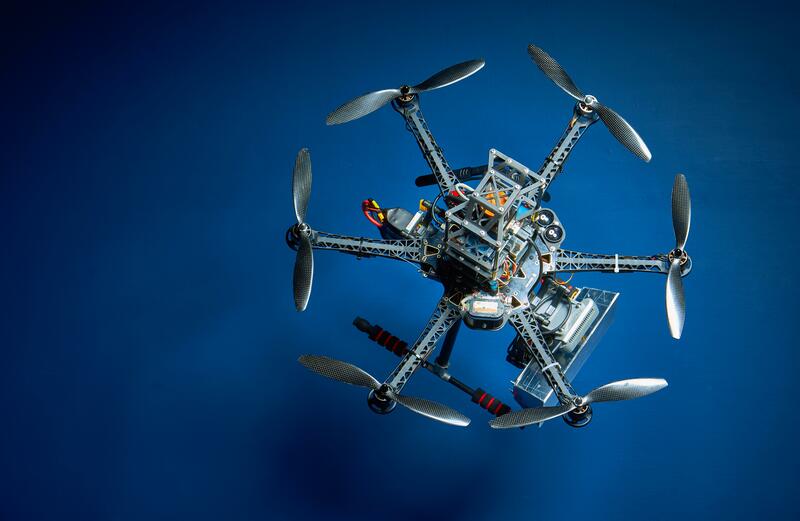 Drones may not feel, but they still make every effort to avoid hitting obstacles and walls that would damage it. Logically, the more precise the positioning the more effective it is functioning in tight spaces and avoiding accidents. Our final challenge concerns environments full of edges and obstacles. Again, some background: optical flow is best used for environments with plain surfaces, such as tanks or tubes — metal walls and nothing else — then it is as simple as using a computer mouse; left is left and right is right. I find it amazing that the laser tech is the same in something as common as a mouse and as exotic as a drone. However, when edgy surfaces are added — in a warehouse, ship tank, living room — optical flow is almost useless, because the drone will be unable to locate the corner and turn. If SLAM algorithms are integrated into the UAV’s software it is more likely to locate the corner and turn. It does so by estimating and then predicting how the surrounding environment looks, constructing or updating a map of the unknown environment, and simultaneously keeping track of what’s going on around it. That said, SLAM is not as simple as it seems and requires almost total reconstruction of the drone. That’s what we are working on now and will release soon. I look forward to sharing it with you. Keep in touch!